The kind of cushion designs you can’t find in catalogues. While there’s nothing wrong with buying your throw pillows online at big chain stores, there will be thousands of other people owning your cushion. But with this one, the Anna Vintage Kilim cushion cover, you are the only person with this in their living room. If you’re on the hunt for textured cushions, you’re going to fall for the colour and pattern on this piece. The picture doesn’t do it justice, with a mustard, black, brown, blue, red, and cream-black, two-tone colour scheme that simply works. It’s one of the most beautiful colour cushions you’ll see. And its high-quality faux fur fabric can be placed in outside, too, adding to your outdoor cushions collection. Take care of this little beauty and it’ll last for a long time. 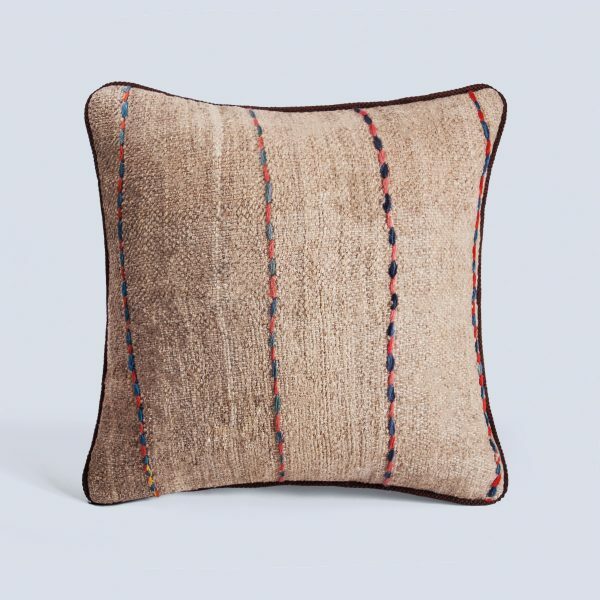 Whether you’re a lover of curated vintage items or just appreciate a quality product when you see it, you’ll be deeply satisfied with the Anna Vintage Kilim. Add a unique energy to your living room (or any room) with these cushion designs. Check out our magnificent collection of cushion designs.